Today: Get out your hammer -- it's time to crack open some coconuts. 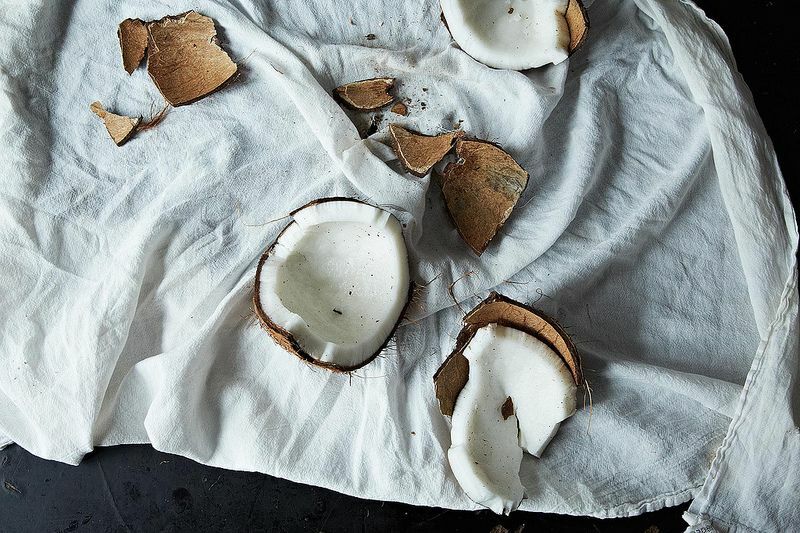 When it comes to cooking with coconut, it’s difficult to persuade cooks not to use the pre-shredded, flaked, and sweetened kind in the plastic bags. And while I’m by no means saying there isn’t a time and a place for those things, fresh coconut just can’t be beat. Tall coconut layer cake, coconut-crusted shrimp, and coconut chutney are some of the nut’s best showcases -- the fresh-grated meat shining in each, thanks to its rich, perfumed fat. Many cooks have called for placing whole coconuts in an oven and letting the heat crack the shell open. This process works perfectly fine for getting the shell off, but it warms the meat inside, softening it too much for my liking -- and if I want the coconut raw for a salad, then I’ll end up with a soft, spongey product. Hacking into one of those damned things isn’t the easiest, but with my trick, it can be really fun -- especially if you have lots of aggression pent up. The only tools you need are a hammer and a flathead screwdriver -- which, if you don’t have these tools already around, you should go buy them so no one will ridicule you in the future -- and an old towel that you don’t mind roughing up. 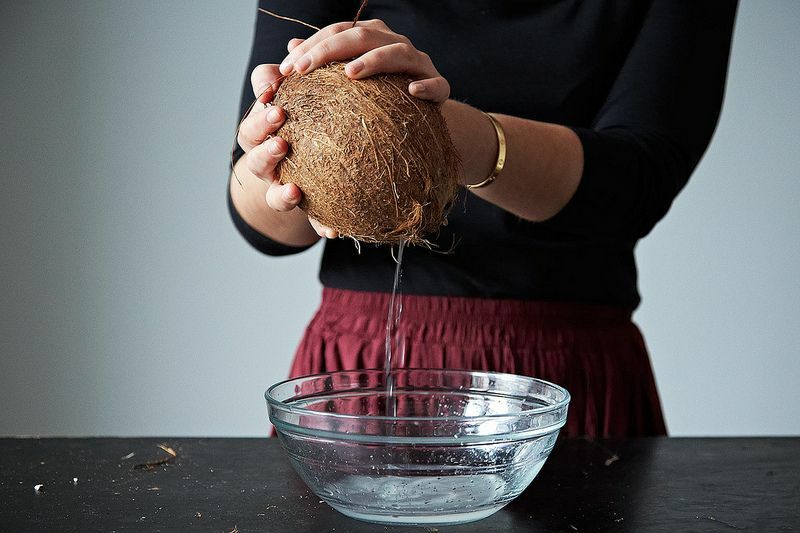 First things first: Let’s get the water out from inside the coconut. It’s nutritious, refreshing, and a helluva lot cheaper and greener than buying it from a bottle. Fold the towel so it creates a thick nest and sit the coconut on top. Position the coconut so its “eyes,” the three bowling ball-like holes, are facing up. Place the tip of the screw driver into one eye, and use the hammer to tap the screw driver through the eye, swiveling the screw driver as you remove it to make a bigger hole. Repeat this with the other two eyes, then tip the coconut over a bowl and let the water slowly drain out. Strain this through a fine strainer, and drink up, or refrigerate it and use it later for moistening a cake or cooking white rice to serve with a curry. 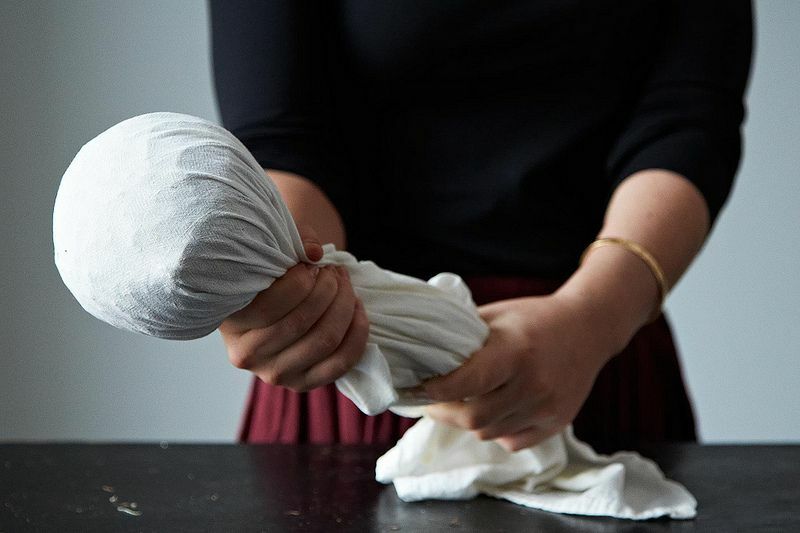 Next, the fun part: Unfold the towel completely and wrap the coconut in it, grabbing all four corners of the towel in your hand to create a sling for the coconut. Imitating someone chopping wood with an ax, swing the towel with the coconut around from your back and slam it onto a hard concrete surface (I used my backyard patio, but if you live in the city, a stoop works just as well). If you use a good deal of force, the coconut should be cracked open into at least a few large chunks. Remove the chunks from the towel, and wedge the screwdriver tip between the shell and coconut meat, and start prying. It should come off fairly easily, in large pieces. Then using a vegetable peeler, simply strip off the brown skin from the meat. 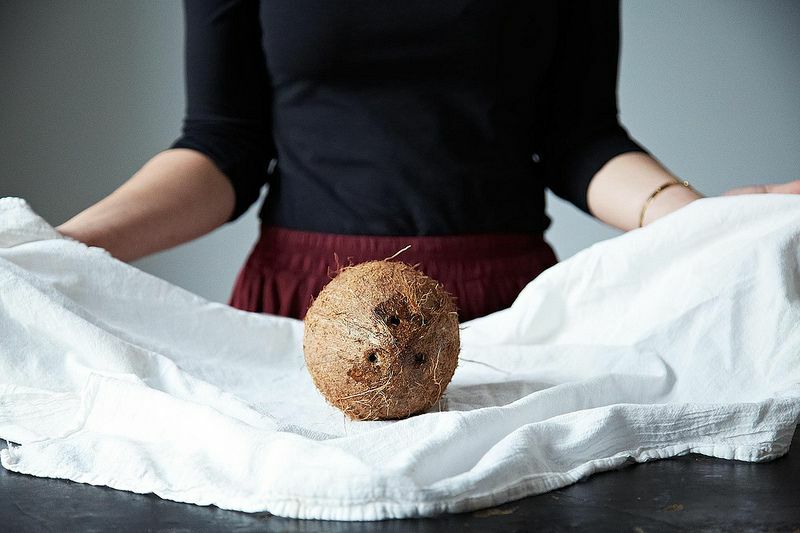 There you have it, fresh raw coconut that you can toss in your food processor to shred and use immediately, or wrap and refrigerate until you’re ready to use it later. And if you need way more coconut than just one will give you, I recommend inviting several of your closest friends over for a coconut cracking party. Everyone will have a blast slamming coconuts on the sidewalk and you’ll have all that coconut cleaned up in minutes...just act normal when the cops get called on you for practicing a shocking new cult ritual. How do you use fresh coconut? Let us know in the comments! Ha Ha, you just need a curved cleaver. Just hold it in your hand and beat it with the cleaver in the middle. It will split in two halves. In time, you will learn to collect all the water without spilling a drop too. People in Asia have been eating the coconut since the dawn of time. Did you think they had a hammer and a screwdriver in those times ? 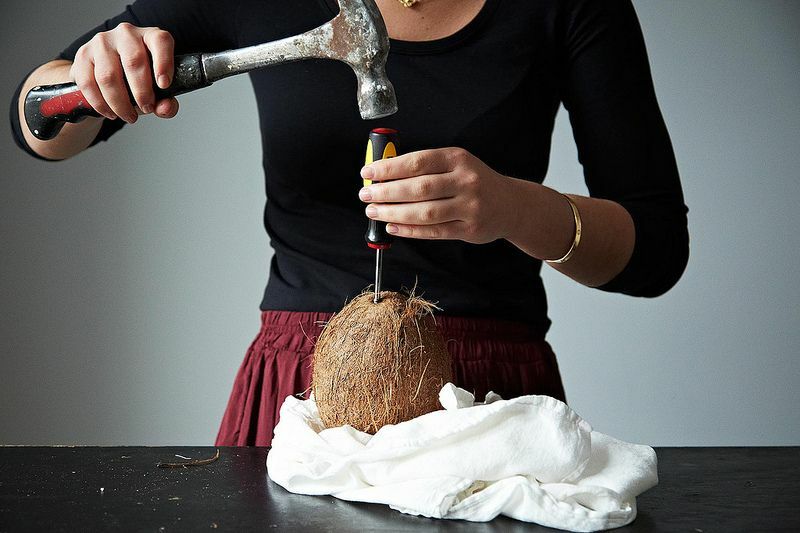 The screwdriver method works great for draining the coconut. But for cracking it? Back of the Wusthof. Everyone is always on message boards exclaiming "It doesn't work! I whacked and whacked!" I'm here to tell you it works. IT WORKS. I just used a hammer and screwdriver.Worked great.The juice was killer and so was the meat.This coconut was found on the ground in Key West-it was Westcellent!!!!!! 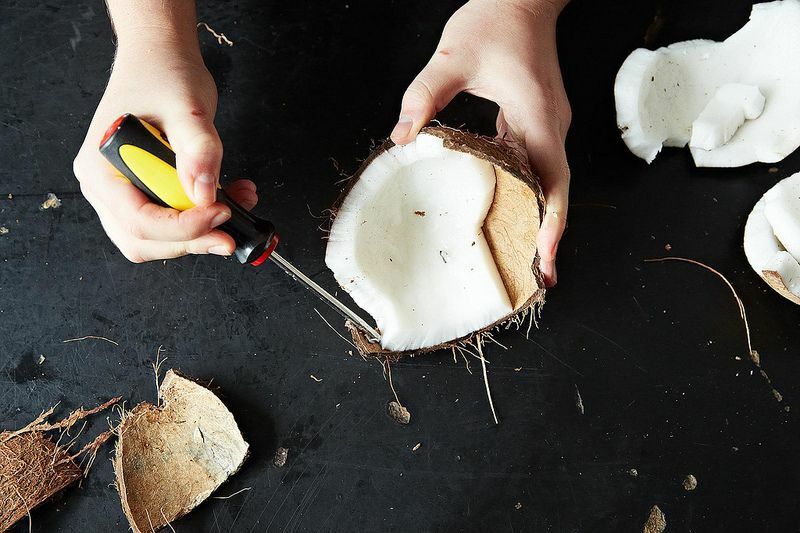 DONT NEED ALL THE HAMMER, CLOTH AND SCREW DRIVER TO CRACK THAT SMALL COCONUT. Get a knife and smack the coconut in half. Use again tool (knife) to slice out the coconut meat. If need to take out coconut meat in smaller slice, use spoon to scrape. It wont take more than 30mnts. =D Peace from Chuuk State, Micronesia! Silau: In 1966, I spent the summer in Samoa, living with a local family in Pago Pago. While telling tall tales and scary stories was a commonplace there, my friends would never pierce the eyes of the coconut because of the superstitions regarding blindness in the unborn. Maybe things have changed, now. 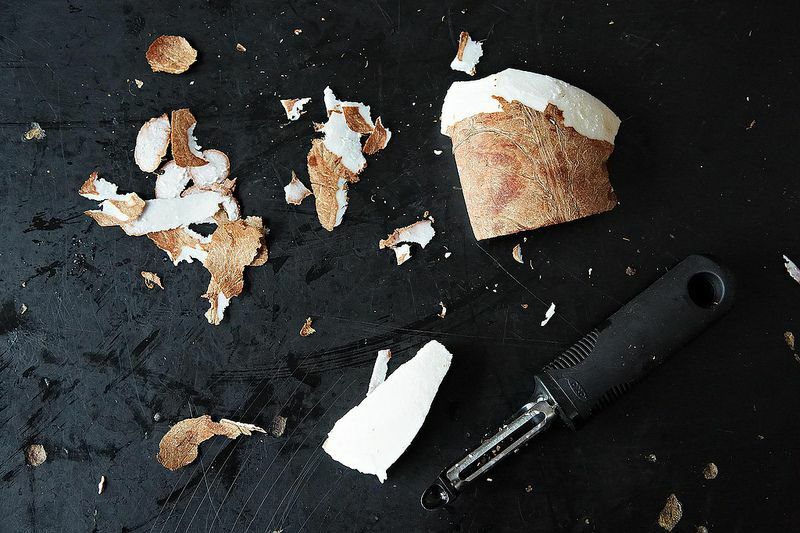 That is one messy way to crack a coconut. We Asians just use a knife to hack the coconut and it'll split into two. I open my coconuts the same way that Greenstuff explains it. If you hold the coconut over a bowl while cracking it you don't spill any of the juice and it is a lot less messy than the way the describe in this article. The traditional, island way of cracking a coconut is nothing like that shown above. If you look at a coconut, there are three seams going from the top (where the eyes are) to bottom of the nut. Holding the coconut in the palm of your hand, nut eyes up, with the other hand, take a hammer (or the back of a machete) and hit the first seam about two thirds of the way up. Then, turn the nut slightly, so that the next seam is visible. Hit that seam, hard, and then repeat the action on the third seam. Each time the nut is hit, it should crack. If it isn't cracking, then you are not hitting the nut hard enough. By the time the third seam is cracked, you should be able to lift the smaller portion off the part left in your hand. Pacific islanders rarely pierce the eyes because of superstitions related to birth and blindness. In the islands, the hard meat in the nut is generally NOT used as food, except to prepare coconut cream and oil. The nuts we get in supermarkets in the US and abroad, are actually quite old. The tough, hard meat is used to produce copra, from which oil is obtained and animal fodder is produced. Young coconuts are highly prized in the islands, especially Samoa, where they are referred to as spoon coconut. Instead of the hard, dense meat with which most foreigners are familiar, there is a soft, sweet, gelatinous substance that can be accessed with a spoon (hence the name) or one's thumb nail. This substance will become the hard, white meat we all know, as the coconut matures. mmmmmmmmmmm I curious to know which island group or who told you about the superstition on piercing the eyes and its effect on birth and blindness. I still adhere to the ol traditional method of using the claw end of the hammer to crack the shell along the equator. So much more quicker it takes about a minute. The trick is to thoroughly drench the wooden shell in water so it doesn't splinter. Not to mention the slew of superstitions that accompany any improper handling of this sacred nut from Indian folklore.. 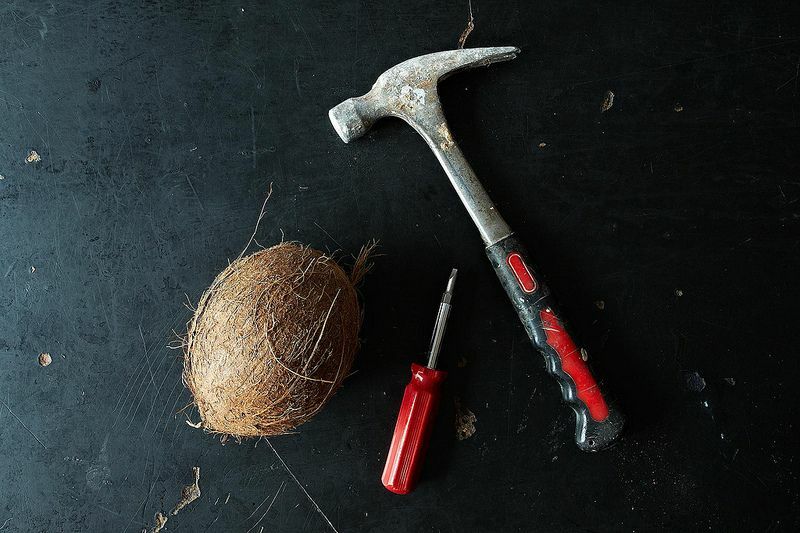 I learned a long time ago that you can actually use a hammer and tap around the 'equator' of the coconut. You just continue to rotate and tap until it breaks along the center. Then you can use a knife if needed to cut the flesh into two halves. It's a little less messy and you can use the shells for crafts, or in our case little 'cocohuts' for the pet hermit crabs. Love the "cocohuts!" I've seen people attack coconuts with everything from machetes to their bare hands. This seems like the most sensible plan of attack, by far. That's the traditional technique used to crack coconuts.. The half shells are then directly shredded off the shell with special coconut scrapers. Eliminates the extra step of peeling the brown pat of the meat. I learned this same method of tapping around the "equator" of the coconut with one hand as you hold it in the palm of the other with the head of a hammer (over a bowl to catch the coconut water!) from one of Madhur Jaffrey's cookbooks. So easy - Neither concrete or great force required! Love this. So much smarter than just going at it with a large rock, which is what I have done in the past. Love the swinging the coconut onto the pavement! With kitchen equipment: hold the coconut sort of "pole-to-pole" in your non-dominant hand. With the back of a cleaver or other heavy knife, whack along the "equator," turning the coconut to get at the whole circle. The coconut will split in half. Hold it over a bowl to catch the water when you pull it apart. This method is surprisingly easy. And a half coconut can make a great baking or serving container. Try baking fish in a half coconut and a Thai curry sauce!